What is the temperament of Greyhounds? What are the ages of Greyhounds available for adoption? 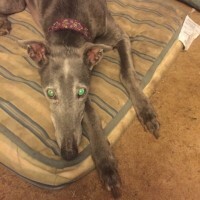 Why do Greyhounds retire from racing? How long does a Greyhound race? 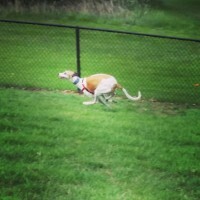 Do Greyhounds require a fenced yard? What if we have an invisible fence? 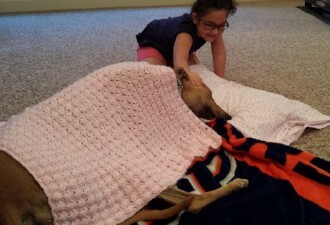 Are Greyhounds suitable for children? Do Greyhounds get along with other dog breeds? 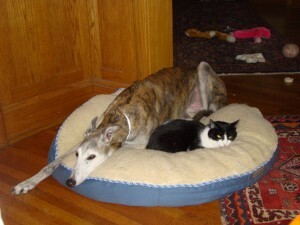 Do Greyhounds get along with cats? Do Greyhounds have any medical issues? Greyhound males stand 26-30? at the shoulder and weigh between 65 and 95 lbs. Females stand 23-26? and weigh 55-75 lbs. Greyhounds are one of the gentlest and most affectionate of all dogs. They are legendary for their quiet, gentle, docile nature. Most people who own greyhounds rave about them and usually adopt more than one! Greyhounds placed through our adoption program are usually between 2 and 5 years of age. We occasionally have older or younger dogs. Greyhound puppies are not usually available for adoption. With proper care, greyhounds have a life expectancy of 12 years or more. Greyhounds retire because they are not fast enough relative to other greyhounds, because they have sustained an injury, or because they lose interest in chasing the lure. Some greyhounds do not qualify for racing after initial training. Many greyhounds race only a few races, some do not race at all, and a few that are very competitive race two years or longer. Most greyhounds are retired between the ages of 2 and 4 years. Greyhounds are the fastest of all dogs and are the second fastest land animal in the world. They can reach speeds in excess of 40 MPH for short distances. Not necessarily. 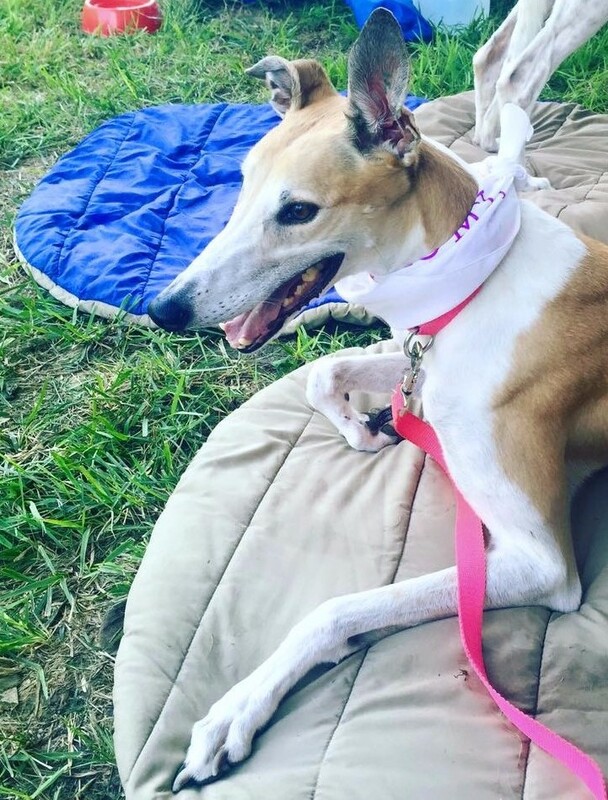 If you are willing to leash walk them regularly, greyhounds can live happily in a home without a fenced yard, a condominium, an apartment, a mobile home, or even an RV. Electric or Invisible fences are not a fit for a dog that can run 40 miles an hour. They will be through the fence and down the street before they feel the zap or vibration of the collar. Additionally, an invisible fence will not stop other predatory animals or other dogs from coming into your yard and attacking your Greyhound. We will not place a Greyhound in a home with an invisible fence. Because they are non-aggressive, gentle, and tolerant by nature, greyhounds normally make excellent pets for families with well-behaved children. As with any pet, children should be taught to handle the greyhound gently and to respect the greyhound’s space while he is sleeping. Dogs of any breed and children should never be left unsupervised. Greyhounds have been with other dogs their entire lives, so they enjoy the company of other dogs. They are gentle and docile by nature, and therefore adapt well in homes with other non-aggressive pets. Yes, but less than most dogs. Greyhounds have no undercoat, do not have a doggie odor, and only need occasional bathing and brushing. Even though greyhounds have been trained to chase a lure, that does not necessarily mean they will chase cats or small animals. Most greyhounds can live harmoniously with cats and small dogs, and sometimes even with rabbits! If a greyhound shows a tendency to chase a cat, we will not place it in a home with cats. Until they come into our foster care system, greyhounds have never lived in a home; however, they are kennel trained and have learned not to soil their crates. It is normally an easy process to transfer this kennel training to your home. Greyhounds have been bred for hundreds of years to be sound and be fast; therefore they are normally very healthy dogs. Greyhounds are the only large breed of dog not plagued by hip dysplasia. Because of their low body fat, greyhounds are sensitive to anesthesia.